With British Sea Power’s new album set for release this week, Getintothis’ Paul Higham caught up with guitarist Martin Noble for a chat. 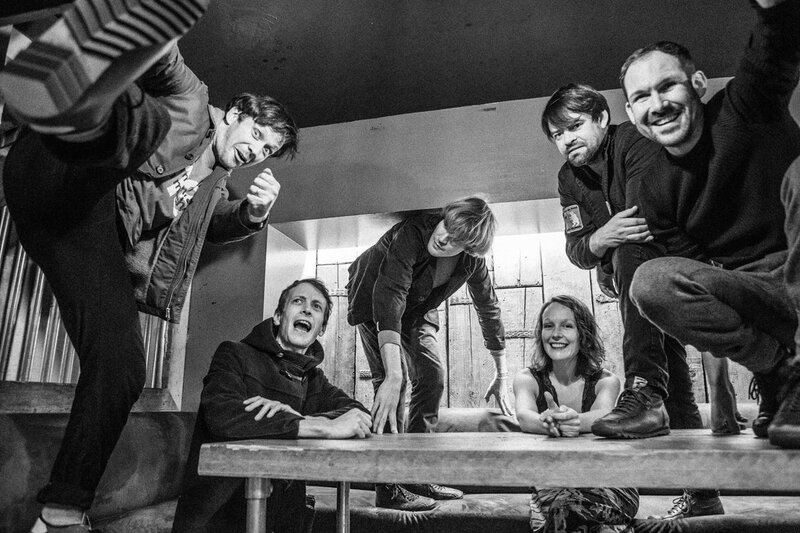 It is very easy to take British Sea Power for granted, survivors of a once-vibrant scene that has long since run its course. Yet this barely tells half the story. In many respects British Sea Power always stood slightly apart from their early-noughties contemporaries, lazily lumped into a post-punk revival scene by a music industry seeking to arrest its flagging fortunes. Always with a strong individual aesthetic they have always done their own thing, venturing far from tried and tested formulae. From the early days of the now-mythologised Club Sea Power nights and stages adorned with foliage to pioneering soundtrack works and brass-led rearrangements of some of their much cherished songs, the band have remained proudly independent. Never one to rely on the usual touring conventions they have forged a reputation for playing unusual venues, yet never for the sake of it or to make a marketing statement. Choices such as the Isles of Scilly, the Carnglaze Caverns in Cornwall or Grasmere Village Hall just seem to fit. There is a naturalness to everything that they do, it never feels forced or contrived with the band largely shunning the limelight and often thumbing their nose to prevailing fashions. Loves of nature, history, art and literature resonate throughout their work. 2013’s Machineries of Joy took its name from a Ray Bradbury collection of short stories while forthcoming album Let the Dancers Inherit is influenced by the striking imagery of Kurt Schwitters. Another defining aspect of the band is the relationship with fans. From the early days the band has attracted a fervent cult following, with many going to extreme lengths to see the band play and needing three figures to count the number of gigs attended. The Battalion – as it is affectionately referred – feels like a family and the relationship is mutual. Special tributes were paid to longstanding fans in the recent Decline of… anniversary edition box set. The band’s supporters have played a part in the group’s longevity, embracing some of the most innovative band merchandise out there as well as devotedly crowd-funding recent releases and projects. Some have even paid princely sums for a British Sea Power-designed tattoo which acts as a season ticket, guaranteeing entry to any British Sea Power gig. The band are now back with their first conventional studio album in four years, due out on Friday March 31. With this in mind we sat down with guitarist Martin Noble to discuss all things Sea Power. Getintothis: How are things? How’s the new album? Getintothis: Do you want to tell us a bit about it, it’s slightly different from some of your earlier works? Martin Noble: “There’s never a huge plan as you set out but I think over the last four years we’ve done some soundtracks, one was a reworking of some of our old stuff and then a couple of other small independent films. “It’s a different writing process, a bit more abstract and when we got round to writing the record we’d already amassed quite a lot of music and just thought it the right thing to do. To freshen things up as well is to just go back to writing classic songs really, you know, verse, choruses, melodies. Getintothis: How much of a challenge is it going back to more of a pop song structure rather than the more ambient instrumental work that you’ve been doing? Martin Noble: “Over the four years we’ve been constantly writing music so we’d amassed quite a few and just put it to one side and thought that’d make a good song. When we looked at everything before we went into the studio and started writing bits and bobs we had about 30 or 40 songs and narrowed the selection down. “Then Cam Blackwood, who is the producer, he helped narrow them down and said “these are all bangers, we should put these on”. His idea was that he thought some sounded more feminine than others and he wanted those ones to go on. Getintothis: Although you said you’d amassed a number of songs over the four years since Machineries of Joy a lot of the press releases and interviews have talked about it being a more political album so how much did the songs change when you started to put them together in an album, how much do they reflect the times? Martin Noble: “I think when you’ve got a lot of things on your mind and a lot of jobs to do it’s sometimes easier to put them down on paper and get them off your mind. I think in a way that’s part of what happens when you’re writing songs there’s a lot of information going round and lots of crazy stuff at international level and even on the local levels. Getintothis: Do you see the role of music to make sense of that confusion and to articulate it in a way that those who best ought to be doing it aren’t? Martin Noble: “Erm, kind of. I don’t worry about pop music and politics that much because some people are much better qualified and you don’t want some idiot pop music and rock singer telling you what you should be doing. “I think It’s good for people to voice frustrations and for those feeling disconnected to get some unity and it’s really powerful when it does work. Getintothis: The artwork that you’re using for the two singles and the album is very different from what had gone before and the videos have a surreal dadaist take on things. Has that been influenced by events and is it trying to convey a message at all? Martin Noble: “That all came about through an ongoing love for Kurt Schwitters’ work, he crops up all the time and every few years something will happen where we find ourselves doing something Kurt Schwitters-related like the time Yan did an installation in Tate Britain on an anniversary of Kurt Schwitters. “We used to use his poem Ursonate at shows which is kind of a nonsense poem but sounds great. In the times of the Nazis he was thought of as a degenerate artist and he had to flee the country but his artwork has been brilliant. “Yan studied typography and wanted the album artwork to be typography-based and was looking through all different kinds of typography and he looked at one and thought “I want to use that” and lo and behold it turned out to be Kurt Schwitters’ typeface so he just keeps coming back. “Video-wise it’s another cut and paste style, rough and ready not bothered about it looking too slick, so inspired by that. “We’re doing a show on April 5 for a Polish film festival and we’re playing to ten classic animations from the 30s, 40s and 50s and there’s a lot of weird cut and paste stuff from there. The innovations they had to make up to do these animations, it was incredible. Getintothis: It’s now 15-17 years since it all began for you. I guess you were initially considered part of a scene but a lot of contemporaries have fallen by the wayside. What do you ascribe to the reasons behind your longevity and why have you endured while others haven’t? Martin Noble: “I think with scenes when bands become part of a scene and that scene dies people are looking for another scene. There’s a fickle nature to promoting scenes. “I think we’ve had an aesthetic of our own and have always done what we wanted to do and have been pretty DIY and have managed to get through. Getintothis: How did the tattoo take-up go – did they all get subscribed to in the end? Martin Noble: “There was five lifetime passes and ten three year passes and they all got taken up. “Not everyone’s got a tattoo. Getintothis: One of the things aside from the music that seems to define you is almost the relationship with the fans. There are very few bands around that seem to have the same fervent, cult following that you seem to have. How do you view that – is it a good thing or a hindrance? Martin Noble: “It’s definitely a good thing. I think we sort of provide an entertainment in a way that’s expansive it’s not simply about music, we’ll take fans to a certain venue, within the music there’ll be characters and stories. Getintothis: You’ve played lots of unusual and off-beat venues, perhaps places where other bands wouldn’t automatically play. You’ve done concerts on a Mersey ferry and we were there at Brownsea Island in the rain a couple of years ago. Where do the ideas for venues to play come about rather than conventional tours? Martin Noble: “We started off thinking up ideas ourselves and then after you get a bit of a reputation for it then loads of fans or people say it would be great if you played here; or we’d get emails through or people would tell you at gigs and you’d look it up. Getintothis: Do you have more plans to bring back the Club Sea Power or the Krankenhaus nights? Are there any of those in the pipeline? Martin Noble: “Yeah. Once you’ve done it for bit you want to leave it behind and do something else but there is something being planned for later in the year. “I can’t say exactly what it is but it’s in the middle of the country and it’s like an all-day Krankenhaus night and we’ll have a couple of really good bands and DJs. Getintothis: I remember seeing Savages at the first Krankenhaus night in January 2012, I’d never seen them before and now they’re massive. How do things like that work, how do the networks develop? Martin Noble: “A lot of the bands came through recommendations. With Savages, Jehnny Beth used to play in a band called John & Jehn and they’d supported us quite a bit and John told us about Jehnny’s new band. “On that first night Y Niwl, the Welsh surf band who Gruff Rhys from Super Furries has in his backing band a lot of the time, were supposed to play but on the morning the main guy from Y Niwl phoned up to say they couldn’t make it as the drummer had decided to leave the band that morning. Getintothis: What do you have planned for the future once you’ve got this album out of the way. Do you think that far ahead or is it one step at a time? Martin Noble: “It’s kind of one step at a time. Things do get thrown in your path as you go like this night of Polish animation at The Barbican. It’s the day before we actually start our tour proper and we’re playing completely different music for it. Getintothis: We’ve just been watching the video for the Keep on Trying (Sechs Freunde) song and it got us thinking about Brexit. We might be reading too much into it, but where do you stand on all that, is it reflected in the music and what impact do you think it will have on musicians? Martin Noble: “I think it’s just to put out a general feeling of openness even to people, whichever way people voted on Brexit. You know we want to be part of Europe and you still can be. “It’s just being, yeah, open, I mean we don’t want to end up going to Europe with a name like British Sea Power with all this stuff behind us. You want to talk openly, you don’t want people to think you are against Europe and really happy to leave. Getintothis: I don’t think anyone who’s familiar with your music and songs, like Waving Flags which is all about openness, inclusivity and friendship, would read too much into the name! Let the Dancers Inherit the Party is released on March 31.